So you want to spend a day on the water? Awesome! This guide is for you. There is nothing quite like the freedom and relaxation that boating offers. Something about heading away from land accelerates the shed of worries and the commitment of terra firma. As soon as you pull away from the dock, you will feel the stress evaporate. There are as many types of boats as there are ways to enjoy life on the water. Every year, boats seem to become more specialized—purpose-built to optimize specific activities. This guide is to help you think through how you want to spend your day and to sort through the options to make sure you rent the right boat for your day trip. Generally, day boating is categorized into five categories: Fishing, watersports, runabouts, deck boats (aka party boats), and day sailboats. Bass fishing boats are designed to be platforms to cast and land your fish. They are flat on top, and you can stand or sit while casting. Bass boats are low to the water and usually propelled by a large outboard motor to make the trips between fishing spots as fast as possible. These boats typically have a fish box you can open with your feet to hold your bounty, as well as a trolling motor you can steer with your feet to maneuver while you’re casting. A deep sea fishing boat that is more of a skiff–small and low to the water. They are about as basic as you can get—a bench seat to sit on and a little storage space for tackle and gear. Pangas often do not have canvas shade structures because they will impede rod motion, so you will be in the sun for the entire trip. A cruiser with a cockpit for fishing, and a flying bridge (elevated helm area) that gives the captain a good view of the fishing area. Sport fishers usually have a cabin with a head (bathroom), galley (kitchen) and seating area to take a break from the action. Waterski boats are optimized to a) pull a skier out of the water, which takes considerable power, and b) to create minimal wake to make it easier for the skier to cut steep turns and whip to the other side of the boat without much disturbance from the boat’s wake. Ski boats usually have an engine in the center of the cockpit area, which can make getting around the boat a bit awkward. The center engine balances the weight of the boat to minimize its wake size. Wake boats are designed to maximize the boat’s wake so that wake boarders can dazzle you with their acrobatics. The engine is usually in the stern (rear) of the boat for that purpose—the weight makes for a bigger wake. Also, many wakeboard boats have ballast bladders—large vinyl tanks that can be filled with water and drained at the press of a button to add heft and increase wake size. A wake surf boat, similar to a wake boat, is designed for a very large wake, and is configured to create a large wake on one side of the boat. Surfing the wake is like surfing an ocean wave that never breaks and never ends. Depending on the surfer’s orientation (which side of the boat they will surf on), the weight of the boat needs to be shifted to the appropriate side of the boat using bladders and passengers as ballast. These boats also have two trim tabs—plates that adjust to manage the boat’s “trim” or angle to the water, to make the wake larger on one side of the boat. The boat then lists heavily to one side, and moves very slowly to create as large a wave as possible. The surfer gets up while holding onto to a short tow rope, and once he or she is propelled by the wake alone, tosses the tow rope into the boat and surfs away. Your standard runabout is multipurpose. Yes, you could ski, fish, or wakeboard behind it (best not try to surf), but it would not be ideal for any of those purposes. These boats are typically used for transportation and socializing. They can have an open bow with seating for 2 to 4 adults in front of the helm, or a closed bow with just a helm and seating area behind it. In both cases, the helm and seating area has a shaded canvas “bimini” top for sun protection. Most have built in coolers and lots of cup holders for enjoying your beverage of choice. Engine options can be outboard motor, or inboard/outboard, where the engine is inside the boat but a large outdrive on the stern (rear) is used to propel and maneuver the boat. Deck boats used to be little more than a platform on top of pontoons, with a helm and an outboard motor. The point is to provide a deck to socialize on, hence the nickname “party boat.” Nowadays, deck boats can be tricked out with high performance engines, heads (bathrooms), sound systems, plush furniture, refrigerators, sinks and barbeques. They are optimized for a party on the water. A day sailboat can be something small (10 to 15 feet) where you sit on the deck and sail from shore—Lasers and Sunfish are popular brands; or a larger boat (15 to 25 feet) with a full cockpit and a small cabin should you want to stop and relax for a while. These are typically no-frills boats where sailing is the objective—when you’re sailing, you’re always busy—and creature comforts are kept to a minimum. That is a quick overview of some of the boats that you might use for a day on the water. 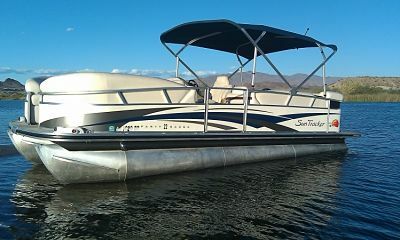 You can browse the options at GetMyBoat.com to see examples of these types of boats and more. Not everyone uses the same terminology when describing their boat, so you may need to look carefully at the boat’s description to discover its best use. The great thing about renting a boat is that you can experiment. You can rent one type of boat one day, and another type of boat the next time you want to get out on the water. Maybe you will find the right boat for your activities on the first day, but if not, keep trying!